Grimm: “The Law Of Sacrifice"
The first 10 minutes of “The Law Of Sacrificed” had me convinced this was going to be the best episode of Grimm all season. Adalind and Renard reunited, convinced by seeing their child (who has a name now!) to suddenly shift into protective parent mode. Nick and Kelly trying to parse out who they need to protect from the Verrat and what they can do about the child. And then C. Thomas Howell, the dearly departed Dewey from Southland, shows up to play Viktor’s loyal FBI henchman in Portland—in addition to Alexis Denisof showing his face in Oregon as well. This episode means business—jettisoning any pretense of a case-of-the-week, and once again dedicating the entire runtime to the importance of Adalind’s baby and the (unclear) need to keep it out of the royals’ hands. 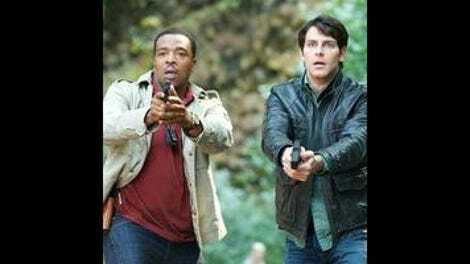 Grimm’s tensest scenes have always been confrontations between the main characters, because episodic cases don’t have as much time to establish a relationship. I can think of only a few scattered episodes—“Organ Grinder” in the first season, or the Sgt. Wu episode earlier this year—that actually made me feel a bit scared. But from the get-go here, the tension between Nick and Renard, with Kelly and Adalind backing them up, is palpable. Sure, there’s not a lot of time dedicated to figuring out how the show arrived at this moment, and because of the nature of the show giving over to cases of the week, there’s not a lot of justification for the paradigm shift. But who cares when the first third of the episode presents an almost Aristotelian unity of time, place, and action as the Burkhardt Grimms argue with and then protect Sean, Adalind, and baby Diana from the impending Verrat attack. Episode director Terrence O’Hara helmed six episodes of Angel, and in three seasons he’s overseen eight episodes of Grimm, including the previous Nick/Sean confrontation in “Face Off” last season. The action here is some of the best in the history of the series, and I say that fully aware that there’s not some big fight choreography. It’s just a heightened state, the weight that Nick, Kelly, Sean, and Adalind give to the situation. Why the royals want the child doesn’t need to be explained—Nick and company want to keep it out of their hands at all costs, and we’ll deal with explanations later. I was worried that the first time the episode cut away from that unity of time and action, it would lose all its momentum and get dragged down from what was making it special. And to a certain extent that’s true. But Silas Weir Mitchell’s performance as Monroe continues to inject comedy in just the right way, so the exposition dump of Nick and Kelly calling Monrosalee to update them on the situation doesn’t just fall flat. It’s a wild shift in tone, but not an unwelcome one, as they react justifiably strangely to the idea of Nick, his mom, his captain, the woman who tried to kill his girlfriend, and a powerful demon baby, are all on the way to Monroe’s house for protection. When things do slow down for a beat, there’s a great little scene between Kelly and Sean about Aunt Marie and the other thing the show seems to have completely forgotten about: the key. There’s still a lot in the mythology of Grimm the show hasn’t bothered to explain, instead just making things up as it goes along. But when it’s as fiercely committed to making the task at hand the most important venture in the moment, it’s much easier to forgive the narrative shortcomings of the show at large. Switching from a royal/Grimm confrontation and the mystery of the keys (or Fuchsbau coins…) to the Chosen One baby plot has led to a bunch of creepy special effects like changing an infant’s eyes to glow purple. It’s eerie—especially when it messes up all of Monroe’s clocks—and it’s a bit sad that the kid can’t stick around for longer and mess things up for everyone Omen-style. It’s clear that Nick, Kelly, Sean, and the rest have some kind of overarching plan. And it’s great that it involves bringing Viktor into the Portland precinct for a face-to-face with Renard, finally putting all the major players in the same location at the same time. But the twist lands with a sickening thud, as Kelly talks with Adalind in an interrogation room long enough to distract her from Renard calmly hand-delivering Diana into Viktor’s arms. That act of concession goes against all the buildup of confrontation before, but it is an unexpected move, so I have to Grimm credit for that. Claire Coffee plays that catastrophic moment of realization as best she can, and with the benefit of the hexenbiest effects it gets a boost. But it recalls another scene of mother-loses-her-child devastation in the final season of Breaking Bad, one that relied more heavily on Anna Gunn’s face to carry the weight of the scene instead of underlining it with special effects. Of course, it all turns out to be a strategic feint. With all seemingly lost and Viktor prepping to jet back to Europe with his prize, masked Resistance members storm the tarmac and take back Diana—and in the final reveal, it’s all of the New Scoobies, unmasked as the architects of a ploy to divert blame away from them and onto the nebulous Resistance. In a subtle way it even kind of justifies the strange flashbacks Kelly was having last week, since in her scene with Sean back in Monroe’s house, she talks about having to give up her child in order for him to survive away from the dangers that followed her. That bit of foreshadowing leads to the episode’s ending, with Kelly driving off while Diana makes toy keys float in the air. So Kelly Burkhardt is on the road again, a guest star finished with another mini-arc sent back out into the world, this time with a child to protect. There’s sure to be a significant amount of fallout with Adalind despite knowing that the child needs to be hidden in order to be safe. But this episode felt like a heist in a pressure-cooker. You know what, I’ve gone and talked myself into it. “The Law Of Sacrifice” is the most entertaining episode of Grimm since Nick and Adalind’s showdown back in “Season Of The Hexenbiest.” And this is slightly better to me because it’s got Kelly Burkhardt, and along with her a “damn the torpedoes” attitude toward slowing down to explain everything. I got swept up in this in a way I haven’t during an episode of Grimm in a long time, and even though the show basically shifted the goalposts for one episode (the preview for next week suggests a return to case-of-the-week instead of closing out the season with serialized stories) to advance the plot much further—that’s why it gets a bit of a grade boost. Grimm has no idea where it’s going or what any of the mythology means, but when it boils down to an exciting hour that doesn’t slow down enough for all the nagging questions to creep in, that’s a win. Adalind slept with Sean’s brother, but Sean slept with Adalind’s mother, so hey, maybe they deserve each other. 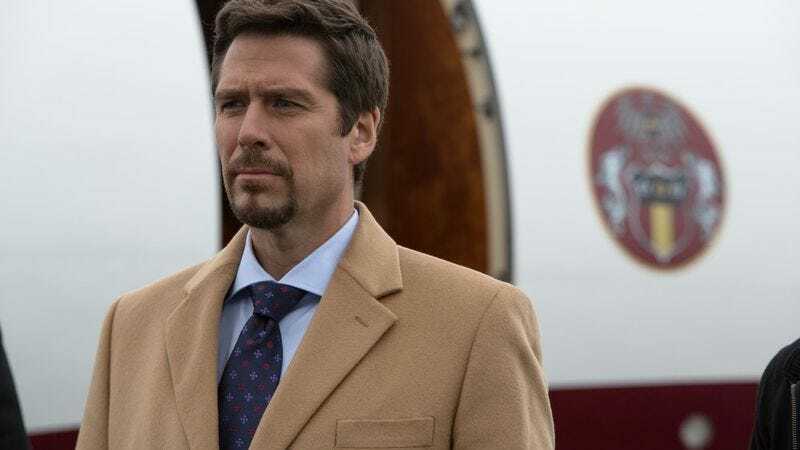 Hank and Juliette only appear for a few minutes each, but they both do something important: Hank helps out with surveillance and the final showdown on the tarmac, while Juliette secures Kelly’s getaway vehicle.